Perú has many places rich with history and tradition; but of those places, one stands out not just for historic value but for its unique beauty and energy that gives it the rightful title of The First National Marvel: The Baths of the Incans. 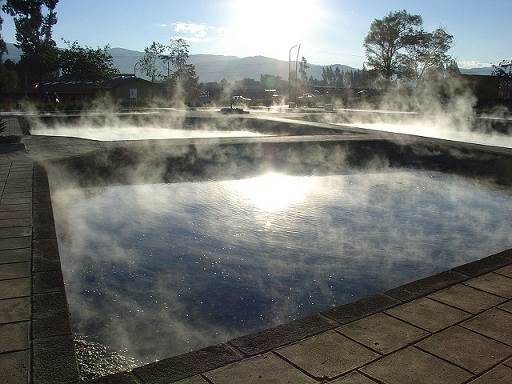 The district of The Baths of the Incans (formerly known as Putmarca) – whose resort hot springs have been christened The Inca’s Thermal Villa – is located six kilometers (3.7 miles) from the city Cajamarca. Its namesake, as told by historians, is a result of the Spanish arrival to the town Cajamarquino and finding its sovereign Atahualpa enjoying a relaxing bath in what is known as “The Inca’s Well”, which is one of most attractive and enjoyable sites available. Apart from the glorious architecture that has resisted the ravages of time with admirable force, what distinguishes this tourist attraction are the hot springs on its land which provide a great relaxation and have worked as treatment for circulatory, muscular, and joint problems. Sitting in a spring, bathers are treated to the incomparable view of the heavy green-forested areas encompassing the baths. These areas belong to the Valley of Cajamarca whose terrain and blending of colors turn it into an ideal landscape for hikes, horseback, or bike riding with a sunny climate that climbs up to 21C° (69F°). There are two ways to Cajmarca from Lima. The shortest is through airplane, which takes an hour to arrive at Armando Revoredo airport – which is half an hour from the city’s center. But if you prefer to observe and experience the splendid countryside, then there’s a bus that takes a 15-hour trek through the scenic Panamericana Norte road. The Hostal Monumental is the most highly recommended places to stay with it being half a city block away from the historic district. The lodge offers Internet and fax services as well as private garages, a café-bar, and cab services. El Fogón restaurant located inside Hotel Laguna Seca & Spa can give guests a taste of the local cuisine. The establishment has an exquisite menu that ranges from fusion platters of Peruvian and international foods to the more traditional dishes of the region like la Patasca a hearty corn stew, el Caldo Verde a delicious green broth exclusive to the region, el Picante de Cuy another exclusive but spicy dish, and la Mazamorra de Harina which is a traditional dessert of Perú with corn and cinnamon as its base flavors. In the city center you will find the Restaurant Bufet de Arte El Batán (jirón Del Batán 369), which offers platters native to Perú as well as international foods and is for those diners who wish to eat their meals accompanied by live music and performances on weekends. Among the tourist agencies that organize trips to Cajamarca – and especially to The Baths of the Incans – P&A Capoverde Tours offers three days and three nights packages which includes hotel transportation, meals, and a long-list of professional guides for all of the noteworthy and attractive city sites and hot spring baths. To truly enjoy Cajamarca’s lands you’ll need sunblock, sun shades, parkas for the night, and a durable umbrella in case rain-showers catch you by surprise at a point in your stay. Next Article What is the Inca Path?